This is a pattern for the THREE nature spirits from My Neighbor Totoro. 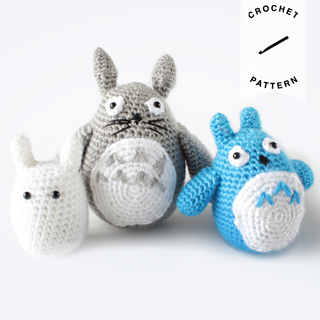 The PDF includes patterns for Totoro, Chu, and Chibi. The largest one is about 8 inches tall and the smallest in about 2 inches tall. The bodies are all made in one piece, and then the other features are added on top. They each take less than 2 hours to make (the smaller ones take much less time) and are really easy to create. Note: This includes THREE patterns in one PDF. Skill Level: Beginner, and easy to follow along since it only uses basic stitches and techniques. There are pictured, as well as written, instructions in the PDF. Materials: Worsted weight yarn in a few colors, fiberfill stuffing and a crochet hook.